"Art must have grandeur and moral purpose." "The artist must be a philosopher and have no other guide except the torch of reason." "A painter should be a man of order." "The function of art is to make virtue adorable and vice repugnant." "The same truth that guides the pen of the historian should govern the pencil of the artist." 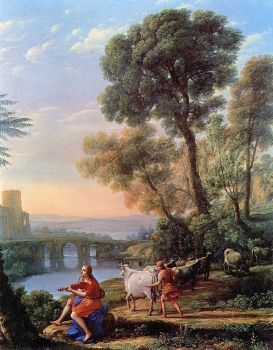 Claude Lorrain's A landscape with Apollo guarding the herds of Admetus and Mercury stealing them (1645), depicts a scene from Greek mythology with contemporary details, as Apollo is playing a violin and Mercury resembles an ordinary villager, thus bringing the classical past and present reality into one serene vision. While Nicolas Poussin and Claude Lorraine were both French Baroque artists who spent most of their working lives in Rome, it was their distinctive emphasis on a more classical approach that appealed to Neoclassical artists. 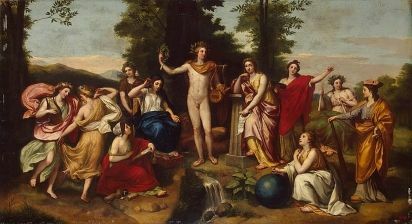 Claude, as he is commonly called, painted landscapes, using naturalistic detail and the observation of light and its effects, with figures from mythological or Biblical scenes, as seen in his A landscape with Apollo guarding the herds of Admetus and Mercury stealing them (1645) An effect of orderly harmony was conveyed in many of his works, which appealed to Neoclassicism's belief that art should express the ideal virtues. 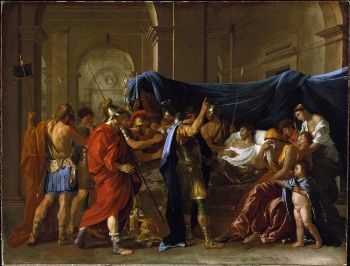 Nicolas Poussin's The Death of Germanicus (1627) depicted the death and suspected assassination of the popular Roman general as recorded by the Roman historian Tacitus. While he was also a noted painter of religious subjects, Nicholas Poussin's mythological and historical scenes were his primary influence on Neoclassicism. 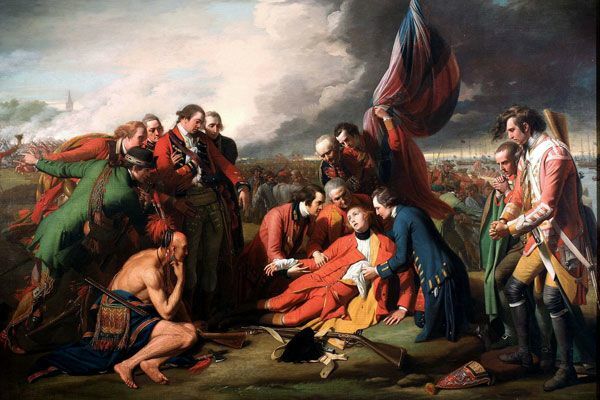 His The Death of Germanicus (1627) made him famous in his own time, and influenced Jacques-Louis David as well as Benjamin West whose The Death of General Wolfe (1770) draws upon the work. Though the works of Venetian Renaissance artist Titian influenced his color palette, Poussin's compositions emphasized clarity and logic, and his figurative treatments favored strong lines. 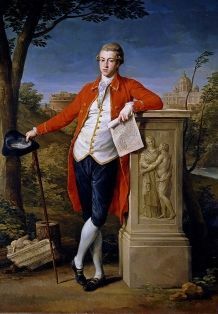 Pompeo Batoni's Francis Basset (1778) depicted his subject, a future British Baron, as the quintessential aristocratic tourist on the Grand Tour in Rome leaning against a fictional Roman altar with St. Peter's Basilica and the Castel Sant-Angelo in the background. Neoclassicism was inspired by the discovery of ancient Greek and Roman archeological sites and artifacts that became known throughout Europe in popular illustrated reports of various travel expeditions. Scholars such as James Stuart and Nicholas Revett made a systematic effort to catalog and record the past in works like their Antiquities of Athens (1762). Wanting to see these works first hand, young European aristocrats on the Grand Tour, a traditional and educational rite of passage, traveled to Italy "in search of art, culture, and the roots of Western civilization," as cultural critic Matt Gross wrote. Rome with its Roman ruins, Renaissance works, and recently discovered antiquities became a major stop. Famous artists, such as Pompeo Batoni and Antonio Canova, held open studios as many of these aristocratic tourists were both avid collectors and commissioned various works. Anton von Maron's Portrait of Johann Joachim Winckelmann (1767) depicts the historian contemplating a reproduction of Greek art, while writing, and with a Greek bust behind him. Neoclassicism began in Rome, as Johann Joachim Winckelmann's Thoughts on the Imitation of Greek Works in Painting and Sculpture (1750) played a leading role in establishing the aesthetic and theory of Neoclassicism. Though German, he lived most of his life in Rome where several notable Catholic officials became his patrons. Arguing that art should strive toward "noble simplicity and calm grandeur," he advocated, "the one way for us to become great, perhaps inimitable, is by imitating the ancients." The work, which made him famous, was widely translated, first into French, then into English by the artist Henry Fuseli in 1765. 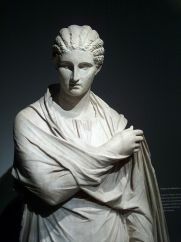 Small Herculaneum Woman (30-1 B.C. E.) is a noted sculpture found during the excavation of Herculaneum. In 1738, the ruined city of Herculaneum was discovered and excavated, followed by the excavation of Pompeii and Paestum in 1748. In the sudden eruption of Mount Vesuvius in 79 CE the cities had been covered in volcanic ash, so that elements of ancient everyday life, noted sculptures, and many frescoes were preserved. 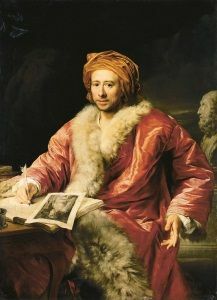 In 1758 Winckelmann visited the excavations, and published the first accounts of the archeological finds in his Letter about the Discoveries at Herculaneum (1762). The title page of Johann Joachim Winckelmann's Geschichte der Kunst des Alterhums Vol. 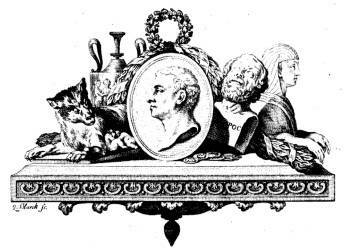 1 (1776) shows Winckelmann in the center, with a bust of Homer and the Sphinx on the right, and the she-wolf with Romulus and Remus, legendary founders of Rome on the left with an Etruscan vase behind them. Winckelmann's masterwork History of Ancient Art (1764) became an instant classic, as art historians Francis Haskell and Nicholas Penny wrote, his "most significant and lasting achievement was to produce a thorough, comprehensive and lucid chronological account of all antique art - including that of the Egyptians and Etruscans." He was the first to create an orderly vision of art, from beginning to maturity to decline, looking at a civilization's art as integrally connected to the culture itself. The book influenced noted intellectuals both of his time and in the following centuries, including Lessing, Herder, Goethe, Nietzsche, and Spengler. Influenced by his close friend Winckelmann, Anton Raphael Mengs was an early pioneer of Neoclassical painting. The circle of artists that gathered around Mengs and Winckelmann positioned Rome as the center of the new movement. Mengs noted frescoes, depicting mythological subjects led to his being dubbed "the greatest painter of the day." He influenced a number of noted artists, who were to lead the subsequent development of Neoclassicism in Britain, including Benjamin West, Angelica Kauffman, John Flaxman, and Gavin Hamilton. He also influenced Jacques-Louis David, who led the later period of Neoclassicism centered in France, as the two artists met during David's Prix de Rome stay from 1775-1780. 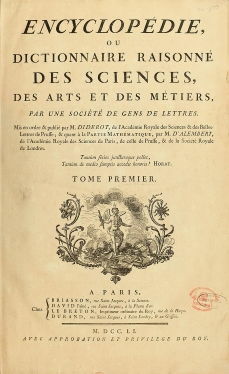 This image shows the title page of the first volume of the twenty-eight volume Encyclopédie, ou dictionnaire raisonné des sciences, des arts et des métiers (Encyclopaedia or a Systematic Dictionary of the Sciences, Arts and Crafts) (1751-1772), edited by Denis Diderot and Jean le Rond D'Alembert. Neoclassicism developed with the Enlightenment, a political and philosophical movement that primarily valued science, reason, and exploration. Also called "The Age of Reason," the Enlightenment was informed by the skepticism of the noted philosopher René Descartes and the political philosophy of John Locke as the absolutes of the monarchy and religious dogma were fundamentally questioned, and the ideals of individual liberty, religious tolerance, and constitutional governments were advanced. The French Encyclopédie (Encyclopedia) (1751-1772), representing a compendium of Enlightenment thought and the most significant publication of the century, had an international influence. Denis Diderot, also known as a founder of the discipline of art history, who edited the work, said its purpose was " to change the way people think." As historian Clorinda Donato wrote, it "successfully argued...[for]...the potential of reason and unified knowledge to empower human will and ...to shape the social issues." Adopting this view, Neoclassical artists felt art could civilize, reform, and transform society, as society itself was being transformed by the rising forces of the Industrial Revolution, driven by scientific discovery and invention. Joseph Wright of Derby's An Experiment on a Bird in the Air Pump (1768) depicted a scientific experiment as a heroic moment. 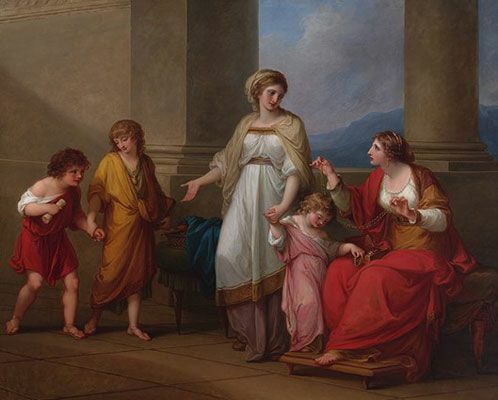 In Britain, the Neoclassicism of Benjamin West, among other artists, took on a more contemporary message, emphasizing moral virtue and Enlightenment rationality. 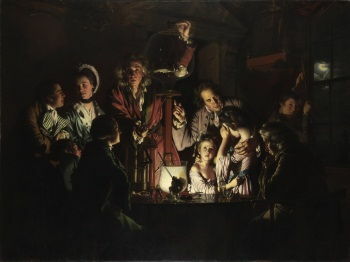 Other artists such as Joseph Wright of Derby created works informed by scientific invention as seen in his An Experiment on a Bird in the Air Pump (1768) or Philosopher Lecturing on the Orrery (1766). Rather than mythological subjects, British artists turned to classical historical accounts or contemporary history like West's The Death of General Wolfe (1770), in which he challenged the academic standards, refusing the advice to depict the soldiers in Roman togas as not based on reason or observation. Jacques-Louis David's Oath of the Horatii (1784) was drawn from an account of the Horatii family in ancient Rome. The later period of Neoclassicism, centered in France, emphasized strong line, austere classical settings lit with an artificial light, and simplified elements to convey moral vigor. 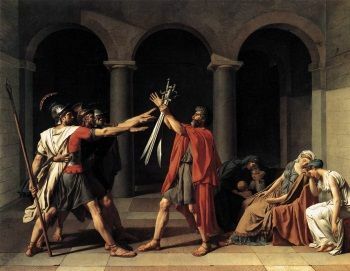 Shown at the 1785 Paris Salon, Jacque-Louis David's Oath of the Horatii (1784) exemplified the new direction in Neoclassical painting and made him the leader of the movement. The artist completed the painting while he was in Rome, where he associated with Mengs, and, subsequently, visited the ruins at Herculaneum, an experience that he compared to having cataracts surgically removed. Although Oath of the Horatii (1784), appealed to King Louis XVI, whose government had commissioned it, with its emphasis on loyalty, the painting became subsequently identified with the revolutionary movement in France. The French Revolution was a period of far-reaching political and social upheaval that overthrew the monarchy, established a republic and culminated as a dictatorship under Napoleon inspired by radical new liberalist ideas. The Jacobins, a highly influential political club of the time, adopted the salute of the Horatii brothers as seen in David's The Tennis Court Oath (1791). David's influence was so great that the later period of Neoclassicism was dubbed "the Age of David," as he personally trained artists including Anne Louis Girodet-Trioson, François Gérard, Antoine Jean Gros, and Jean Auguste Dominique Ingres. Influenced by Venetian Renaissance architect Andrea Palladio's designs and informed by the archeological discoveries at Herculaneum and Winckelmann's theories, Neoclassical architecture began in the mid-1700s and spread throughout Europe. The ensuing style, found in the designs of public buildings, notable residences, and urban planning, employed a grid design taken from classical Roman examples. Ancient Romans, and before them even older civilizations, had used a consolidated scheme for city planning for defense and civil convenience purposes. 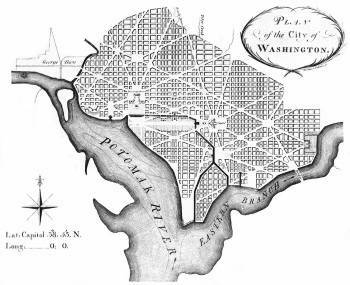 At its most basic design, the plan emphasized a squared system of streets with a central forum for city services. However, regional variations developed in the early 1800s, as the British turned to the Greek Revival style, and the French to the Empire style developed during the reign of Napoleon Bonaparte. Both styles were connected to a sense of national identity, encouraged by the political environment of the time. 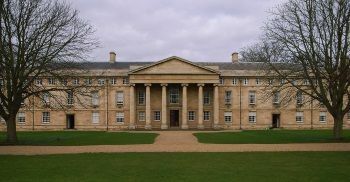 This photograph shows William Wilkins' Downing College, the Cambridge chapel (1807-1821) that exemplified the Greek Revival style dominating British architecture the first half of the nineteenth century. The British Greek Revival style was influenced by the archeological findings of James Stuart and Nicholas Revett who published The Antiquities of Athens (1762), and the discovery of several Greek temples in Italy that could be easily visited. British Greek Revival architecture, led by the architects Williams Wilkins and Robert Smirke, noted for its emphasis on simplicity and its use of Doric columns, influenced architecture in Germany, the United States, and Northern Europe. Carl Gotthard Langhans's Brandenburg Gate (1788-1791) in Berlin was a noted example. 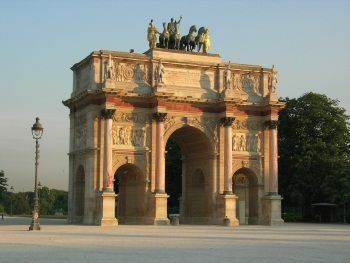 This photograph shows Pierre-François-Léonard Fontaine and Charles Percier's Arc de Triomphe du Carrousel (1801-1806) modeled on the Arch of Constantine (312) in Rome. As Hugh Honour wrote, the French Empire style "turned to the florid opulence of Imperial Rome. The abstemious severity of Doric was replaced by Corinthian richness and splendor." Charles Percier and Pierre Fontaine, both of whom trained in Rome, were the leading architects of the style, as seen in their Arc de Triomphe du Carousel (1801-1806). The triumphal arch became a noted feature of the style, both in France as seen in the Arc de Triomphe de l'Étoile (1806-1836) and, internationally, as seen in the Navra Triumphal Arch (1827-1834) in Saint Petersburg to commemorate the Russian defeat of Napoleon. 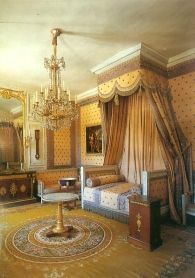 Napoleon's bedchamber (c. 1804) in the Grand Trianon, Versailles exemplified the Empire style. Interior design and furnishings in the Empire style were partially influenced by the discoveries at Herculaneum and Pompeii. Empire interiors, meant to impress, employed gilded ornament often with a militaristic motif or motifs evoking ancient Egypt and other civilizations conquered by the Romans, and in the early 1800s conquered by Napoleon. Both in architecture and design, the Empire style became international, as it corresponded to the Regency style in England, the Federal style in the United States, and the Biedermeier style in Germany. 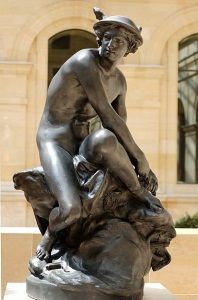 Jean-Baptiste Pigaelle's Mercury (1744) was his reception piece for the French Royal Academy. The French Jean-Baptiste Pigalle was an early leader of Neoclassical sculpture. 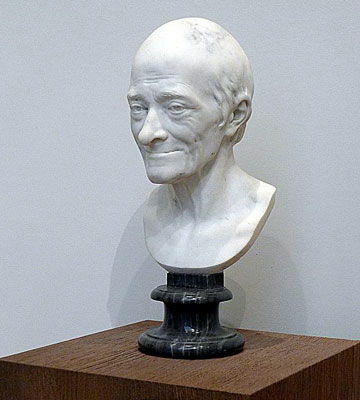 His Mercury (1744) was acclaimed by Voltaire as comparable to the best Greek sculpture and widely reproduced. Pigalle was also a noted teacher, as his student Jean-Antoine Houdon, renowned for his portrait busts, subsequently led the movement in France. 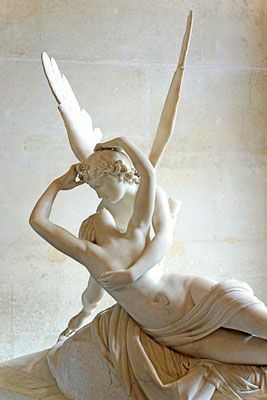 As the movement was truly international, the Italian sculptor Antonio Canova was considered to be the leading exponent of Neoclassicism as his works were compared in their beauty and grace to those of the ancient Greek sculptor Praxiteles. In England, John Flaxman was the most influential sculptor, known not only for his figures such as his Pastoral Apollo (1824) but his reliefs and his Neoclassical designs for Josiah Wedgwood's Jasperware, an internationally popular stoneware. Neoclassicism in painting and sculpture began declining with the rise of Romanticism, though in the early 1800s the two styles existed in rivalry, as Ingres held to Neoclassicism, by then considered "traditional," and Delacroix emphasized individual sensibility and feeling. By the 1850s Neoclassicism as a movement had come to an end, though academic artists continued to employ classical styles and subjects throughout most of the 19th century, while opposed and challenged by modern art movements, such as Realism, Naturalism, and Impressionism. Nonetheless Ingres' work continued to influence later artists as he evolved away from Neoclassicism and into Romanticism with his female odalisques and their elongated backs. He impacted Edgar Degas, Auguste Renoir, Henri Matisse, and Pablo Picasso, who were informed by his figurative treatments with their stylistic distortions. David's work, particularly his The Death of Marat (1793), was rediscovered in the mid-19th century, and, subsequently, influenced Picasso and Edvard Munch, as well as contemporary artists such as Vik Muniz. Contemporary artist Cindy Sherman's History Portraits (1988-1990) repurposes a number of famous Neoclassical works through self-portrait film stills. 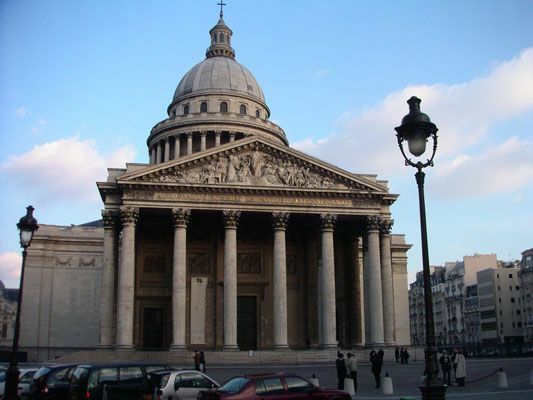 While Neoclassical architecture declined by the mid 1800s, its influence continued to be felt in new movements, such as the American Renaissance movement and Beaux-Arts architecture. Additionally, architects commissioned to create noted public projects continued to turn to the style in the 20th century as seen in the Lincoln Memorial (1922) and the American Museum of Natural History's Theodore Roosevelt Memorial (1936). The Soviet Union also frequently employed the style in state architecture, both at home and by exporting it to other communist countries.